It amazes me that over a hundred years ago, folks were able to produce great images. 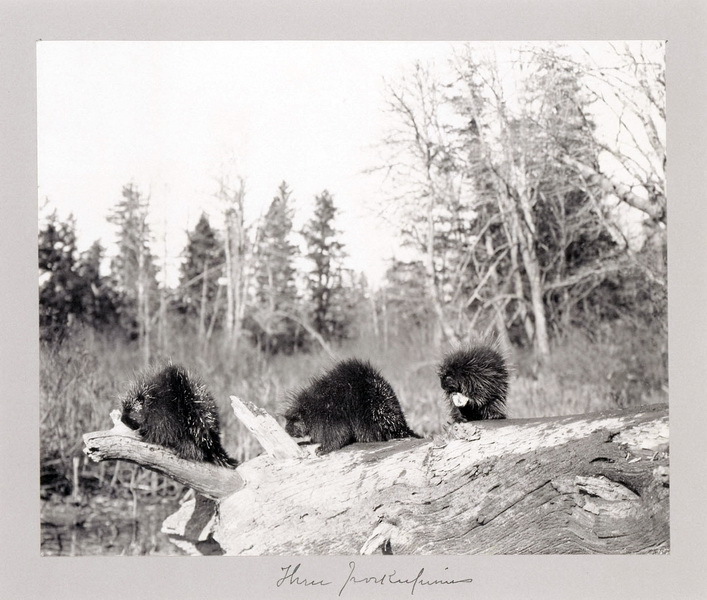 Here is an picture called Three Porcupines, by William Lyman Underwood, c.1895. yes - but professional photographers have made great photos since the start of photography. maybe it will be beneficial to use more time on each shot? John, that is a wonderful image! Too bad those weren't badgers. Can you imagine using a brush from one of those chaps in the pic? Longer than that. There are great images from the Civil War and before. What amazes me is that photographers lugged glass plates to places I NEVER would lug glass and the required darkrooms, just to get an image. That having been written, while I love my digital cameras, I really do mourn the (more or less) passing of film. But I really do like having my darkroom in my computer. Great photography is as rare as great art. The great photographers knew the value of light and would wait all day for the right light before shooting, or come back at the same time the next day hoping to catch that perfect image. Though black and white, few would argue that Ansel Adams has a peer when it comes to the use of composition and light. (03-10-2014, 02:00 PM)Aimless1 Wrote: Great photography is as rare as great art. The great photographers knew the value of light and would wait all day for the right light before shooting, or come back at the same time the next day hoping to catch that perfect image. +1 He was a magnificent photographer! Can you imagine taking pics as in the old days. We would have a weekly SOTD, instead of a daily SOTD! (03-10-2014, 02:38 PM)celestino Wrote: Can you imagine taking pics as in the old days. We would have a weekly SOTD, instead of a daily SOTD! Wow, 8 hours! Can you imagine doing that for our SOTD pics?! (03-10-2014, 02:00 PM)Aimless1 Wrote: Though black and white, few would argue that Ansel Adams has a peer when it comes to the use of composition and light. Ansel Adams lugged hundreds of pounds of equipment up mountains and would sit for days waiting for just the right light for some of his most famous works. The patience and skill required for these masterpieces cannot be understated. Photographs on glass plates, you had to know EXACTLY what you were looking for as far as lighting etc as it would take days to get to your shooting location, more days to get the lighting just the way you wanted it, and days to get back down. Only then would you begin to develop your plates in the darkroom and hope you got what you thought you got. While there is no doubt there are excellent artists today with a camera, it is a different era. You can shoot hundreds of pictures in a row to get just the right one. Post processing to make your pictures far more vibrant, or to isolate one color or object with color. I sometimes wonder what Adams could have done with today's equipment. (03-10-2014, 08:22 PM)celestino Wrote: Wow, 8 hours! Can you imagine doing that for our SOTD pics?! Heh daguerreotypes preceded photography as a means of portraiture but took almost an hour of sitting time to develop. Hence why no one smiled; holding a smile is more exhausting over that time.